There were no high level meetings in Rome between the Italian President Berlusconi and Ahmadinejad. Western Leaders, including Italy, chose the “American Stance” in dealing with Mahmoud. They did not meet with him. It was not a pleasant trip to Rome for Mahmoud Ahmadinejad. The Mayor of Rome Gianni Alemanno dimmed the lights on the City Hall Plaza in protest of Ahmadinejad’s visit to the city. Protestors waved Israeli flags, shouted Israel’s name, and handed out leaflets proclaiming in Italian “We Don’t Want You” outside the summit on Tuesday, where Ahmadinjead was attending a United Nations Food and Agriculture Organisation meeting. Nearby in Rome’s City Hall, The Union of Italian Jewish Communities, Italian politicians, equality campaigners and Iranian exiles held a “Free-Iran” sit-in and heard speeches highlighting the threat of the leader. Rome’s Mayor Gianni Alemanno dimmed the external lights of the City Hall plaza, designed by artist Michelangelo, for 15 minutes on Tuesday night in protest. 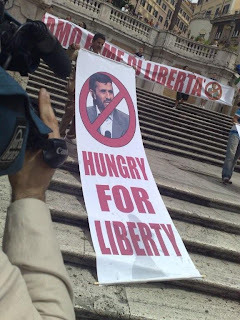 ITALIANS PROTEST AHMADINEJAD!! Hundreds Protest in Rome!